There are a few different software packages (aka host software) which can be used to controlled a Reprap. There is Pronterface, Repsnapper, and the creatively-named RepRap Host Software. Kliment’s pronterface (aka Printrun) is one of the most supported and popular at the moment. It had a lot of recommendations behind it, so I thought that it would be the best one to go with. It was a little bit tricky to install, mostly because if you use a mac you also have to install wxPython as well as pyserial, which requires a command and installation from a command line. First up, I tried to connect to the electronics. For some reason, the usb serial ports which I had previously used to connect Arduino to the electronics weren’t showing up, so I had to reinstall that software. It seems like it disappears every time the computer is rebooted, so I’ll have to track that problem down. After a little bit of fiddling with the wires (I didn’t even strip them) I was able to get it to correctly read 22 degrees. 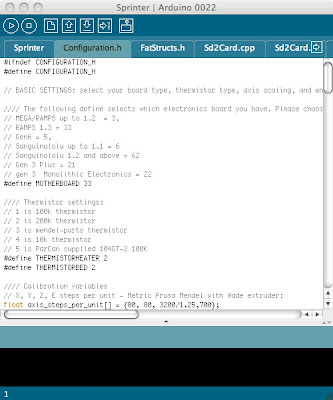 My next steps will be to install skeinforge inside of pronterface, and I’ll hook up a stepper motor and make it spin. This entry was posted in reprap and tagged electronics, host software on August 23, 2011 by David. Auzze’s RAMPS board came with Sprinter firmware already installed, but unfortunately, I’m not able to use this as-is. The thermistor’s that came with the hot end were 200k thermistors, and the pre-installed firmware was set up for the standard 100k thermistors. 2. Download the Sprinter firmware. 3. Make changes to the firmware’s configuration.h file, then upload. I was then ready to upload. The first time I tried to upload it didn’t work; didn’t recognise the board. I then realised that I need to specify the board to load onto. 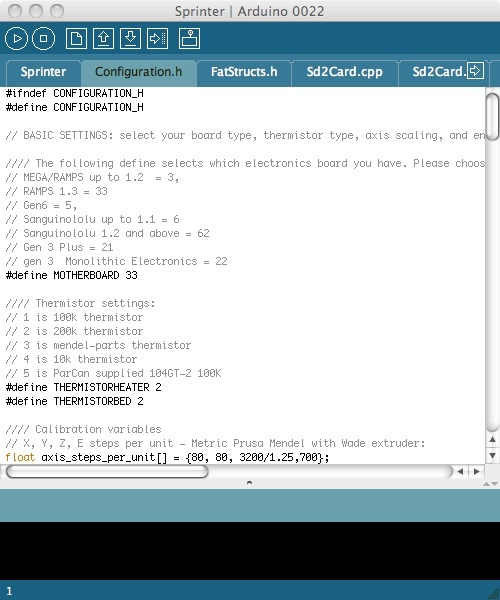 In the arduino software, I had to set the board to ‘ATMega1280’, and the USB port. However, there were no USB ports to choose from on the list. The default ports that came with the software were only Bluetooth ports, so I had to run the other piece of software that came with the Arduino package (FTDIUSBSerialDriver). This added two extra USB port options to the software, which enabled the computer to connect up to the board. Once this was done, the new firmware loaded quickly onto the board. Of course, I’ve got no way of testing it yet, so I’ll install Pronterface next. Thanks for the great after-sales support, Auzze! This entry was posted in reprap and tagged electronics, firmware, sprinter on August 21, 2011 by David. so E0 / E1 are for the extruder motors, D10 is for the extruder heater, and D08 is for the heated bed. I still need to find out what Aux4 is for. This entry was posted in reprap and tagged electronics on August 20, 2011 by David. One major part and one important tool arrived this week. The first thing that arrived was an IR thermometer – a Fluke 561. My wife was instantly convinced as to its usefulness when I showed her how to take the kid’s temperature very quickly using it. This should come in very handy when trying to calibrate the prusa, and trying to get the temps on the heated bed and the hot-end correct. One thing I like about this thermometer is that you can plug in a K-type temperature probe. The 561 comes with a velcro-strap thermometer that you can wrap around pipes. One major downside to this thermometer that I didn’t realise when I purchased it is that the K-probes will only work up to 100 degrees C. (For no good reason that I could determine.) The other feature that would be nice would be to be able to turn the laser off. You can do this when you you’ve got a probe plugged in, but not at other times. The other thing that arrived this yesterday was the electronics kit. I got this from ‘Auzze’ – one of the Australian members on the Reprap forums. He sells a complete kit, including endstops, plugs and an SD card reader. I can see where the voltage comes in for the shield. Does the Arduino need its own voltage supply? What’s the ‘Aux 4’ input / output for? Is it for an LCD screen? The ‘X’ ‘Y’ ‘Z’ outputs are pretty straight-forward. I presume the ‘E0’ and ‘E1’ are for the hot-end and heated bed respectively, but I’m not certain. I’m not sure which plugs are for the temperature sensors – is it the ‘T0’, ‘T1’ and ‘T2’, or the ‘D8’, ‘D9’ and ‘D10’? It looks like I’ll have to do a bit of research before I start plugging things in. That’s almost everything I need for the Prusa. The only thing left to get now is the hardware kit. I suspect that it will be a while yet – it’s coming by sea-mail. At least I should have a pretty good idea on the electronics by then. This entry was posted in reprap and tagged electronics, thermometer on August 19, 2011 by David. As I mentioned in a previous post, I purchased an Arcol.hu hot end. This week, I started assembling it. Lazlo’s got some good instructions up on his website, so I was able to follow those and assemble the hot-end without any dramas at all. The biggest hassle with assembling the hot-end is trying to protect the thermistor. It’s quite fragile, and the arms can break quite easily. So naturally enough, you start off by wiring up the thermistor. The very thin connecting wires were quite fiddly to try and strip as well. After that, you need to connect up the power resistor in a similar way. Next up is to fit the power resistor into the heating block. It’s quite interesting to see that most of the hot part of the hot-end is made of aluminium. I haven’t chatted with Laslo, but I suspect that it’s because the thermal gradient on aluminium is extremely steep. Away from the active heating area, it will cool down extremely quickly. I suspect that this is why Arcol design has such a short hot zone. This also makes it easy to fit the power resistor, as you can then safely use aluminium foil as a wrap around the power resistor to ensure a tight fit. The next step is to put in the thermistor and seal it into place using fire cement. In Lazlo’s build instructions he usually attaches the nozzle first, probably to make sure that there’s enough space for it to screw it. I didn’t want to risk contaminating the nozzle with any rogue cement, so I did it separately. I first wrapped up all the bits that weren’t going to get fire cement on them with Kapton tape, then put in the cement. I then left it to dry for a couple of days. The wires are protected with heat-resistant covers then the nozzle assembly is attached to the frame. The covers weren’t quite long enough to prevent the thermistor’s trailing leads from touching each other, so I wrapped some more Kapton tape around them to stop them shorting out. At this point, the instructions on the website diverge slightly from the current hot-end. The instructions on the website are for version 3.0 of the hot-end, but the version he’s currently selling is version 3.01. There are only small differences, mostly down to an improved heat-sink. It’s pretty easy to guess the correct way to put the remaining pieces together. In all, quite a fun and interesting build. My only gripe is that the PEEK block doesn’t sit totally flush with the lower mounting assembly. This results in a very slight angle to the nozzle. You can see this in the photo below. I can’t really see how this could be a problem for printing though. The millimetre or two of offset isn’t going to cause any problems, as long as it’s consistent. This entry was posted in reprap and tagged hot end on August 17, 2011 by David. It’s from Lybina, and it looks pretty good. The dimensions are 2.93mm on the long axis, and 2.84mm on the short axis. That makes it a lot more consistent than other filament out there, but you’d expect high tolerances from an Australian manufacturer. Prices were pretty good too, so I was more than happy to go Australian in this case. I expect that it should melt down nicely. This entry was posted in reprap and tagged filament on August 13, 2011 by David. Still more parts this week, but one of them I can actually do something with! Aluminium pulleys. These are supposed to give a better quality of print, by having less slop and backlash. A pretty cheap printer upgrade. A wand-type temperature probe for my (forthcoming) temperature gun. A super-short heated zone. From what I’ve seen during my research, the Arcol hot-end probably has the shortest heated zone of any hot end. This should greatly reduced extruder force. A removable and exchangable nozzle in 0.5mm and 0.35mm sizes. An excellent support structure. Unlike most nozzles, it has a fully triangulated structure. This should reduce the movement of the nozzle head during printing, resulting in more accurate prints. The best thing is that this is the first part that I can actually do something with! I can start assembling it right away. This entry was posted in reprap and tagged hot end, parts on August 6, 2011 by David.